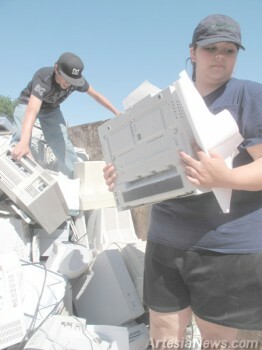 Mariah Villegas (front) and Jessie Stevens of the Artesia Clean and Beautiful (AC&B) Task Force unload computers, printers and other electronic devices from an industrial-sized waste bin this morning in the southeast parking lot at the intersection of Fifth Street and Texas Avenue. Linda Stevens, director of AC&B, said the electronic devices were dredged up from the depths of Abo School Monday. Pointing at the industrial waste bin, which was filled to capacity, she said, “This is just from one room.” National Evolution, an electronics recycling company based in Tulsa, Okla., collects the waste once it has been sorted and packed. Stevens said from 9 a.m. to 5 p.m. Friday and Saturday a dumpster will be placed in the southeast parking lot at the intersection of Fifth Street and Texas Avenue where electronic waste will be collected from the public. For more information, contact Stevens at 748-3192.